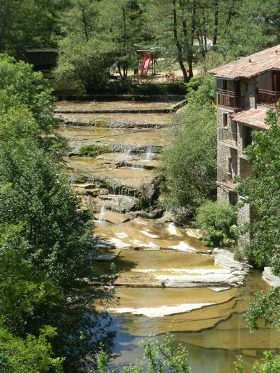 Rupit is a small village situated almost centrally between Girona, Vic and Olot isolated in the hills above the barrage lakes like the Panta de Sau of the river Ter. 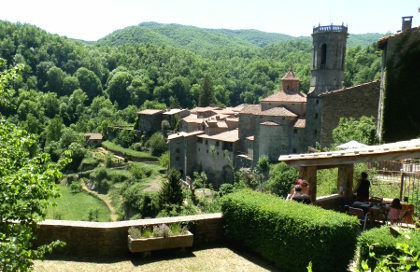 It had been recommended to us several times by different people, however, the relatively remote position - it's about 26km from Olot or about 30km from Vic with one road in or out - meant that we hadn't found an opportunity to visit. Taking advantage of the May sun, we discovered it really is a jewel comparable to the best Catalan villages like Besalu, Pals or Peratallada and well worth the journey. We've included the route we walked, though in practice this was more of a visit and explore than an actual walk. 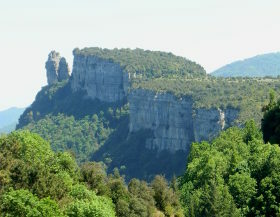 However, the area is full of interesting looking footpaths and geography - like the cingles cliffs (escarpments) of Collsacabra and rivers and streams that drain into the Ter, and the extinct volcanoes. The village is at 822m, so relatively high in the hills with cols at 1000m at the entrance and exit to the plain - both cols giving excellent views across the countryside below. The village was also busy with visitors including several walking groups and we noticed there is camping and accommodation nearby for a longer stay. The journey really starts in the car and we drove through the valley by Angles, close to Cellera de Ter which marks the exit of the river Ter from the hills with some huge artificial lakes. 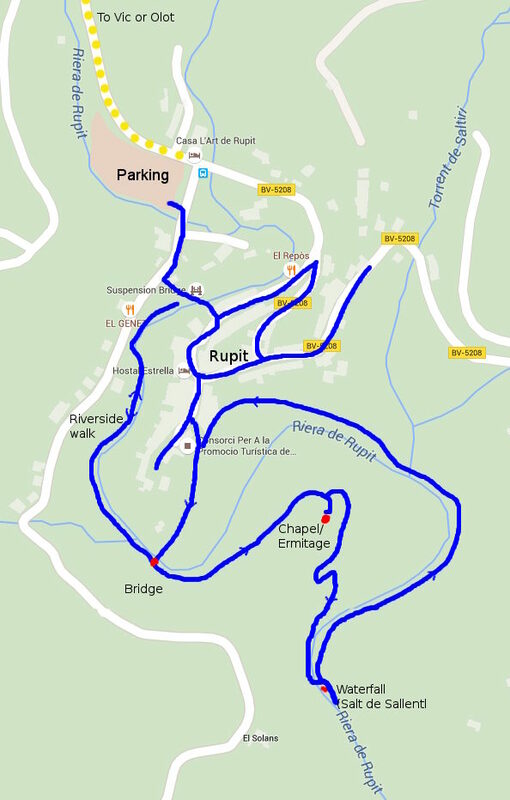 We knew Rupit was to our right, but it's not until we got to Sant Esteve en Bas, about 4km from Olot that we reach the road up to Rupit. The drive climbs steadily, winding up until we get over the Coll de Condreu (1010m) and onto the top. The road was quiet - one pro-cyclist doing some hill training - so we were a little suprised by the number of cars and buses in the large car park at Rupit village. The first sense of the village was looking to the houses perched under and on rock-sides and the river running clear over sheets of rocks down into the heart of the village. 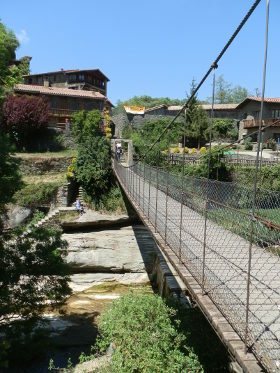 To get to the centre, the access route is over a small wire-and-wood pedestrian suspension bridge that is limited to 10 people at a time, as it sways and bounces as we walk over the small river below. 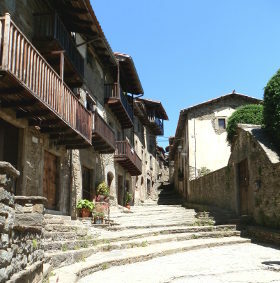 On the other side of the bridge, step lead up to the narrow main road through the village and rows of old 17th Century houses built in grey stone reminiscent of a remote alpine village. The road only has two or three junctions, so we explore a little, following the path up into the higher parts of the village up steps cut into the rock past houses with geraniums and old wooden balconies sitting underneath a weathered rock outcrop. Gently weaving our way back to the heart of the village, the bars and cafes next to the church are filling up for lunch and walkers with proper hiking gear are returning from their morning trip. A number of different paths are marked, but its quite busy, so we follow the quieter route marked towards the Ermitage/Hermitage that can be seen on the opposite side of the valley. The path goes down to the river and a solid stone bridge and the water just tempts exploring, so rather than go direct to the Ermitage, we follow around the river to the right under a dripping waterfall and under rocky overhangs with shallow water playing over the rocks, only to find ourselves on the river underneath the suspension bridge for a different view of the town. We return back to the stone bridge and follow the path up through the woods to the Ermitage - a small chapel standing isolated in a field with the best views back over the village and also, from the far side, views to a stunning landscape of escarpment (cingle) cliffs and wooded valleys. From the chapel we turn to the right taking us away from the village and the path we came up, slowly navigating our way down to the river base below. In amongst the trees we see people sitting on the rocks above a waterfall (a Salt in Catalan is a waterfall) - the Salt de Sallent - which was also marked from the village. The waterfall is quite high as we can tell from the sound and the fact we can't see the base from the top. We climb down to see if there is a better view, but though we see smaller falls at the bottom, we don't quite see the full extent of the waterfall (online pictures suggest there is a viewpoint that we didn't find). We return back through the woods, following the river emerging in the fields at the bottom of Rupit before taking the path through and archway and back into the village. With more time there would be much more to explore in this area. 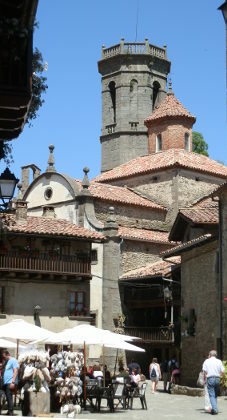 From Girona, Olot or Vic there are a lot of possibilities for things to see. Our drive back via Vic/Roda de Ter was also very picturesque with views of Collsacabra and then grand vistas to the mountains over the Plana de Vic.